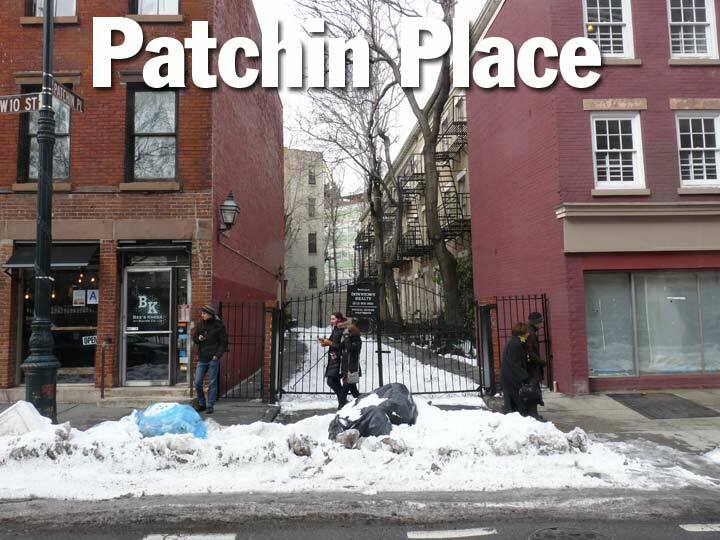 Patchin Place, a dead end squeezed onto the north side of West 10th Street between 6th Avenue and Greenwich Avenue, has its own intrinsic charms, but it’s notable because Manhattan has not had a great deal of dead-end alleys since 1900 at least, and likely long before that. Manhattan, which has always been paved over and rebuilt upon relentlessly, has given up many of its alleyways, some picturesque, some slummy and dangerous. This space is landmarked, so it’ll likely be here as long as Manhattan exists. 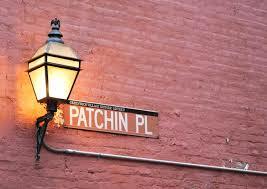 Patchin Place was created in 1848 or 1849 when Samuel Milligan, the owner of the parcel, decided to build ten townhouses facing each other across an alley. One (#4 Patchin Place) was built as a standalone building, with the rest attached to each other. 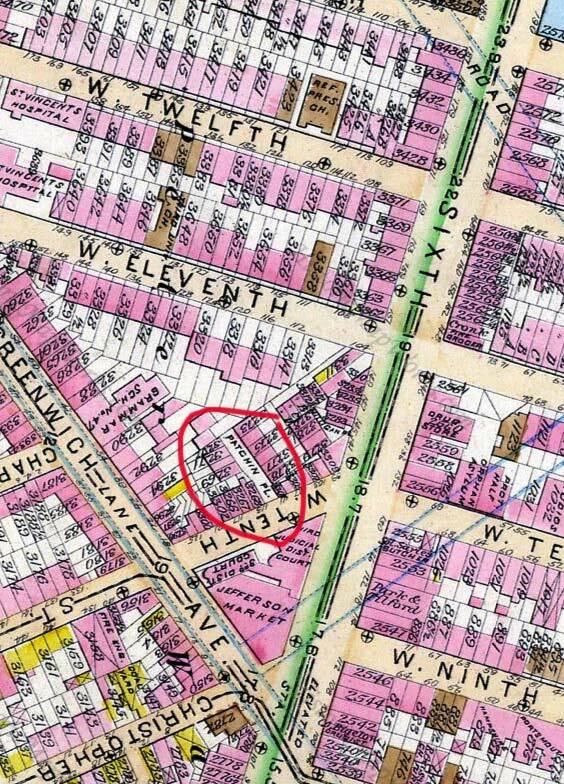 Milligan’s daughter Isobel married his surveyor, Aaron Patchin, and his name was affixed to the alley, though it doesn’t turn up on maps by name until about 1885 (above). 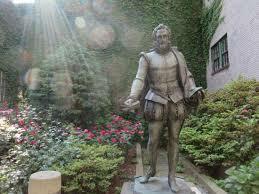 A smaller cul-de-sac issuing from 6th Avenue around the corner was named Milligan Place. It has been thought that the houses were originally built to house (mostly) Basque waiters at the now-demolished Brevoort Hotel on 5th Avenue, but the Brevoort was built in 1855. However the alley may well have been occupied by the workers at some point. 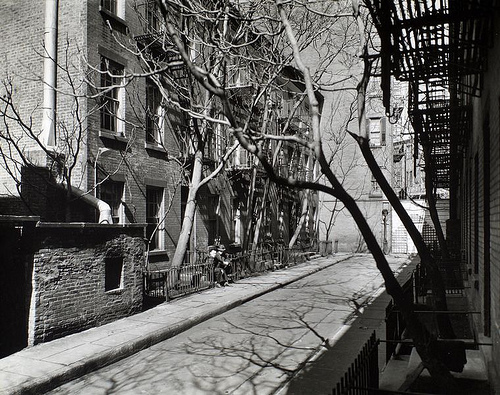 When Patchin Place and its houses were built by 1849, West 10th Street was still known as Amos Street: the principal heir of Sir Peter Warren, who owned the land in the colonial era, was Charles Christopher Amos, and those names were applied to streets when they were built through the area by 1800. Amos Street became West 10th Street in 1857. Patchin Place is closed to traffic, but it’s built conventionally with a roadbed lined by two sidewalks. 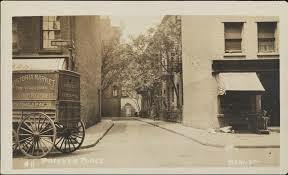 In the past, it’s possible that horses and carriages entered the alley and autos backed in and out, but that hasn’t been the case as long as I’ve known about Patchin Place. A gate sees to it that no cars enter, but the latch is usually open on the sidewalks to allow idlers and photographers like me to enter, as well as actual residents. Tree-lined streets are a dime a dozen in the Village but very few have the reputation of the timeless Patchin Place. This small alley populated with three story row houses dates to the late 1840s but by the early 20th century it attracted writers who could have peace and quiet to work in the middle of bohemia. In the 1910s journalists John Reed and Louise Bryant lived there while Reed finished Ten Days That Shook World, his firsthand account of the Russian Revolution. In 1923 E.E. 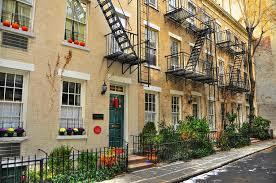 Cummings moved into 4 Patchin Place and described it as having “Safety & peace & the truth of Dreaming & the bliss of Work“. 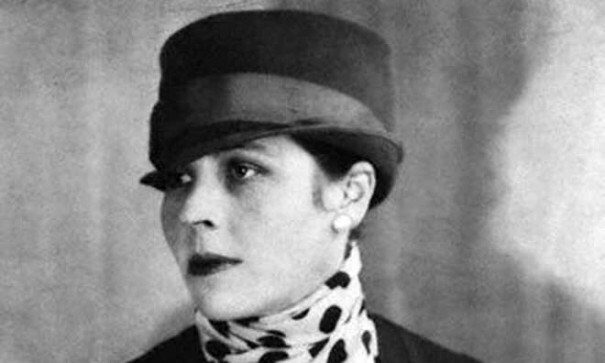 Modernist writer Djuna Barnes, who left the Village in 1921 for Paris, returned in 1940 and moved into 5 Patchin Place where she lived until her death in 1982. There she lived the life of a recluse barely showing her face causing Cummings to routinely shout out his window “Are you still alive, Djuna?”Today Patchin Place remains mostly the same even retaining one of the few original gas street lamps minus the gas. The writers have since been replaced by pyschotherapists giving it the new designation of “Therapy Row”.